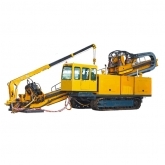 XY-600F hydraulic drilling rig adopts to the latest technology for diamond drilling works. hydraulic stabilizer legs, good rigidity . 4. Equipped with the bottom hole pressure indicator, easy to master the situation inside the hole. the economic benefit of users.